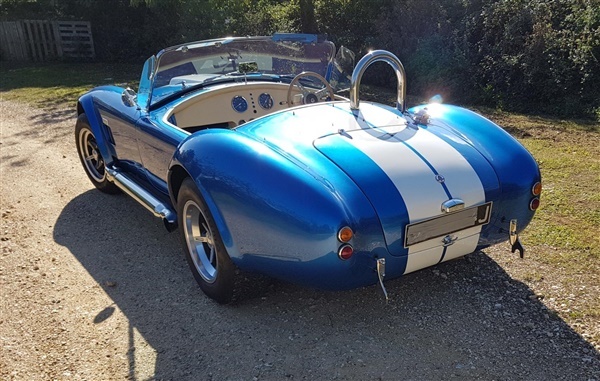 Finished in metallic blue complimented with contrasting Le Mans stripes Correctly registered as southern Roadcraft build date July 98reg 1970 so tax exempt. An awesome example. Arriving soon Historic vehicle Mot 6/8/195.7 l8tr Chevy 5692cc, 4 speed top loader gear box Jag running gear in board. Discs refurbished a year ago, last summer it had a complete new beige interior including blue carpets in cockpit and boot ( Wilton I'm told ) push button start immobilizer, 12v socket, single hoop full hood frame and side screens in black and great condition, zipped tonnau cover,new blue Williams harnesses, retro 4 spoke revolution wheels in anthracite and polished alloy,side pipes Eldelbrock 800 carb. Refurbished rad 2014 The first owner/builder had quite a few bits of the underside chromed wishbones drive shafts, springs, coil overs all round15,200 miles approx Only myself and 2 previous owners, history file has spent some recent years abroad so some bill are in french Chrome lifter jacks. Wood rimmed steering wheel.